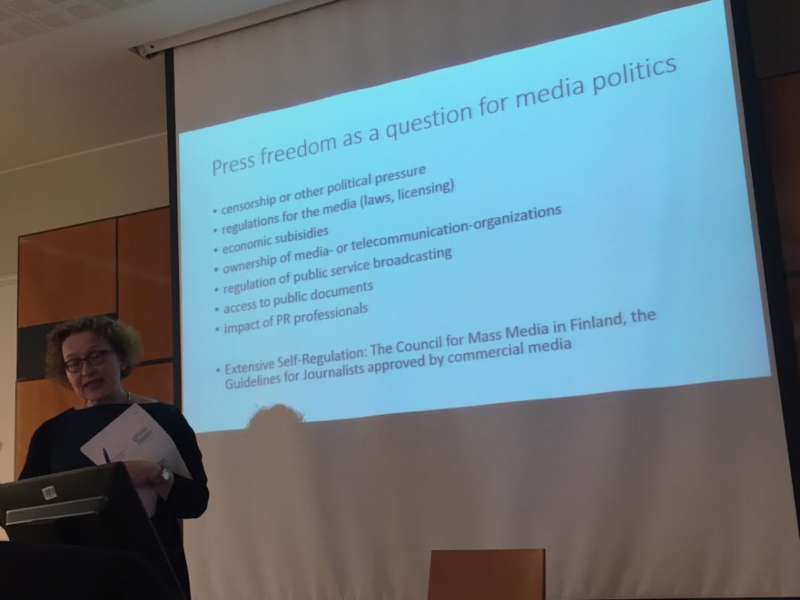 The annual Press Freedom Day’s celebrations are underway in Helsinki, Finland. Organised by UNESCO, the three-day event commemorates the 25th anniversary of the so-called Winhoek declaration, which led to the day to be established. The event features a varied programme, including a full two-day research seminar on the safety of journalists. The seminar includes 17 paper presentations, and an additional 14 posters. Unlike the main event, the research seminar is single-track. After opening words from Ulla Carlsson, of University of Gothenburg, and Guy Berger from UNESCO, the seminar starts with a keynote speech by Simon Cottle, of University of Cardiff. The keynote is followed by one of the event’s two panel discussions, titled “Safety of Journalists – Mapping the field of research”. It will be chaired by Katharine Sarikakis, of University of Vienna. The panel consists of scholars from around Europe, Middle East, the Americas, and Africa. The second panel discussion will close the seminar and evaluate its outcomes. The session will be chaired by Elisabeth Eide, of Oslo and Akershus University College, and the panel will consist of equally international and prestigious membership as the previous one. Further information on the event is available on its website. Here’s a direct link to the main event’s (May 3rd and 4th) schedule (PDF file). On Twitter the event goes by the hashtag #WPFD2016. Edited on 2.5.2016: A stock photograph was changed to a picture from the scene, as it was acquired.